Moon conjoining Mars made it "hot"
11/18/2011 11:31:15 AM MT TG****:: Thanks, Have a great Thanksgiving holiday. I'll be on some tropical island resort off the coast of Thailand snorkeling. 11/18/2011 11:25:38 AM MT Al****:: TG - by the hotline rules that 20/110 crossing would be ignored. The hotline rules do not necessarily catch all the good ones. 11/18/2011 11:16:37 AM MT TG****:: Al, if a really good looking 20/110 upside cross were to take place now would it be no good since more than an hour from last tide time. Spike low right on mid day tide time seems to indicate red tide. 11/18/2011 10:23:38 AM MT BBB****:: FWIW, I have kept a 9 EMA on all my charts and have found it to be a great tell on the 3 minute and the 1 minute whenever good trades set up. 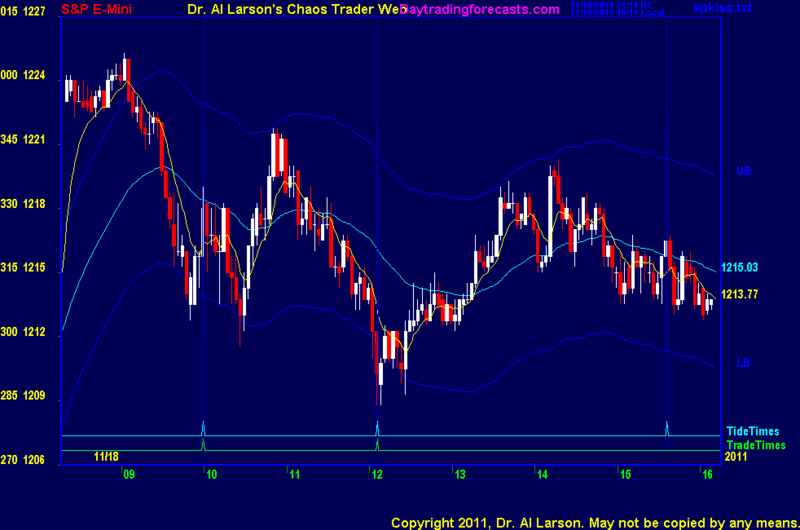 The small rally back up in the last few minutes has been stalled at the 9 EMA... something to maybe try out. It has helped me a ton. 11/18/2011 9:48:01 AM MT BBB****:: It has been a long time since there was a really great Friday. 11/18/2011 9:36:11 AM MT EOE:: do we have another friday stinker???? 11/18/2011 7:06:35 AM MT BBB****:: Morning - here's to a day like yesterday!